These are the tracing rhymes we've used with the students during Carrie's large group each month. The students each have a letter card to trace with their finger as we chant the rhyme. You can use these to review them at home (but be careful not to make this a 'drill and kill' activity, just once here and there, led by your child's choice). B: Start at the top, draw to the bottom. Now bounce the line once, then twice from top to bottom. C: Start at the top, and draw down, half a circle, not a frown. D: Start at the top, and draw down. Go back to the top and draw around. G: Draw half a circle, not a frown. Draw across the middle and then down. M: Draw up the mountain. Go back down. Back up the mountain and down to the town. P: Start at the top and draw down, go back to the top and draw a little bump down. T: Top to bottom, now back to the top. Left to right, and now STOP! A story by Don and Audrey Wood, this little mouse has a big red ripe strawberry that he must hide from the big hungry bear. He picks it, smells it, tries to disguise it, marches around it to patrol it and ends up finding the perfect way to keep it from the bear. He ends up cutting it in half to share with the author and then they eat it up. 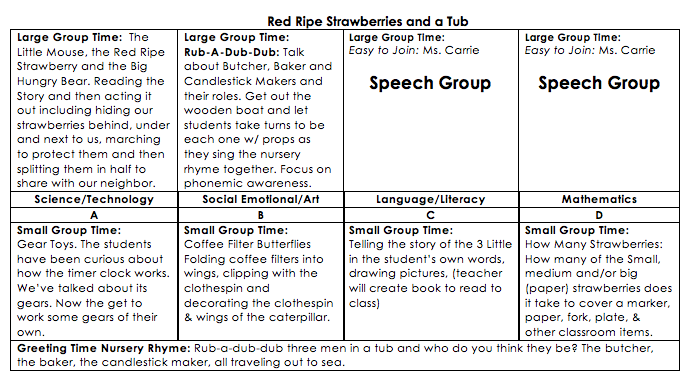 We're going to read the story and then each student gets a 'strawberry' to re-enact the story (with addition terms like behind and under) including sharing it at the end.